West End traders and residents, taxi and private hire companies, transport operators, as well as passengers are all being invited to comment on proposals for a new coach hub for Plymouth. 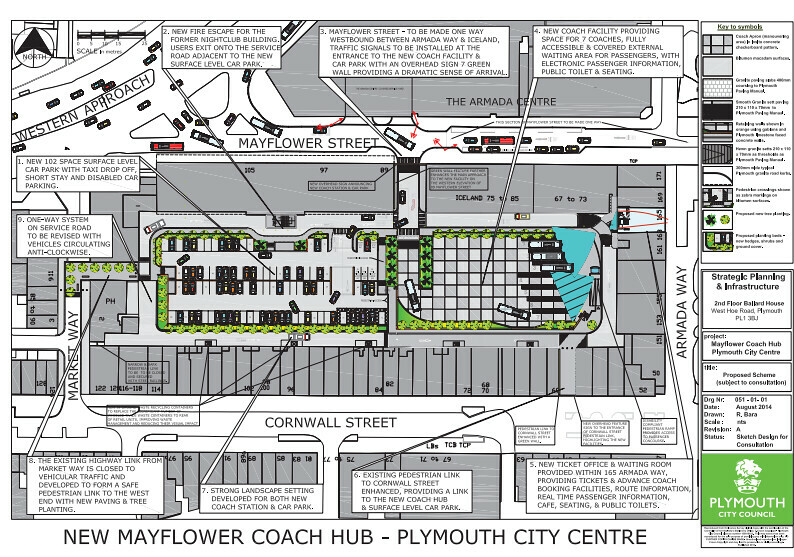 Plymouth City Council wants to hear what people think about their plans for the hub on the site of the Mayflower West car park in the city’s West End. Detailed work has been carried out on the proposal which the Council wants to submit for planning permission in October. And they plan to hold two events at 171 Armada Way on for anyone to come along and have their say on 16 and 17 September. The proposal for ‘Drake Circus Leisure’ is for a 12-screen cinema complex, 13 restaurants as well as parking for over 400 cars as well as extensive improvements to public areas with features, seating and planting. The scheme would transform the link from the city centre to the Barbican and the Waterfront, making it more attractive and easier for visitors and shoppers to move from one to the other. PUBLIC TRANSPORT EXPERIENCE: By Bus It's Hard; Going From Chard  As we shall see, Chard must be one of the worst places that fbb has ever visited with the aim of seeking bus information. IAN VISITS: Museum Meals – Wallace Collection I was in the area watching a steam train trundle through the London Underground and taking a wander down to Oxford Street for some shopping remembered the Wallace Collection has a rather grand looking restaurant. FOCUS TRANSPORT: Art Deco classic Victoria Coach Station made into a listed building Victoria Coach Station, used by millions of Britons and foreign travellers as an international transport hub, has been made a listed building. Culture minister Ed Vaizey announced the move to protect the coach building, which dates back to 1931, as a London landmark. SOUTHAMPTON UPDATE: First roadshow / Xelabus X4 rerouted / Gardbus 139 to run on Saturdays Xelabus X4 was due to be rerouted from 17th September but it looks like that has been brought forward to today. IAN VISITS: New London Overground Map includes the Barking Extension In more detail, the London Overground could, potentially, get an extension from Barking along the existing Tilbury line and then via a new section of railway, to be built as a raised viaduct, heading south after the railway passes underneath Renwick Road Bridge. No mention then of a replacement for the 'tired and worn out' bus station part of the bus and coach station and all the associated vehicle parking. Add in the inevitable extra congestion in Mayflower Street and it looks to me as though local bus passengers will suffer in this scheme. However it does look to be a vast improvement of facilities for coach passengers. Where are they going to park the coaches after dropping off? Is it just for National express etc or also for coaches bringing visitors to the city? ANYTHING is an improvement on Bretonside....! A coach hub with less space for coaches than for cars! I'm not convinced about the layout of the coach facility. There doesn't seem enough room for coaches reversing out of the end bays, with consequent conflict with other movements. Also the entry/exit doesn't look wide enough for coaches top pass each other. I wonder if a tracked path has been plotted for it, and based on 15m coaches at that. This seems to leave open the question of where the bus station is going to go. If the people using the coaches are going to complete their journey by public transport, it would seem to make sense for the bus station to be very close to the coach station. I hope that the 15m coaches used by Both NatEx and Megabus will fit - it looks very tight! It's not wonder visitors think Plymouth is a dump, it is!